"I asked God to give me the strength to remain nonviolent and to forgive the people for what they might do." I was sitting with Drs. David and Jennifer Dillman along with twenty-two ACU students listening to James Zwerg. 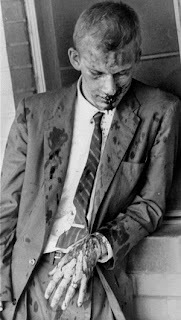 We were in Montgomery, Alabama almost fifty years to the day when James, along with the other Nashville Freedom Riders, got off the bus at the Greyhound station just down the street. The Nashville Freedom Riders were in Montgomery because the original group of Freedom Riders had been attacked in Anniston and Birmingham. Knowing they would face similar attacks, the Nashville riders had come to Montgomery to finish what the original riders had started. James was one of the first off the bus to face the mob, many of whom were carrying pipes, chains, and clubs. 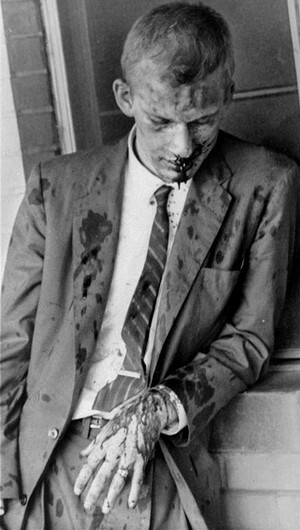 Being the first white Freedom Rider to come into sight James knew he’d face the brunt of the mob’s fury. But right before the blows fell upon him James stopped, gathered himself, and asked God to forgive those about to beat him. How did we wind up in Montgomery on the 50th anniversary of the Freedom Rides? For years David, Jennifer and I had separately dreamed of a bus trip taking ACU students through significant sites in the American Civil Rights movement. The summer before I had been able to scout various locations with my family on the way home from a family vacation. Having shared our visions, back at ACU David and I huddled over maps determined, along with Jennifer, to make this trip a reality. We settled on a route. Abilene. Little Rock. Memphis. Birmingham. Montgomery. Selma. Jackson. Abilene. The circuit would take us through some of the most dramatic moments in American history. Brown vs. Board of Education. The Little Rock Nine. Police dogs and fire hoses in Kelly Ingram Park. The Letter from a Birmingham Jail. The bombing of the 16th Street Baptist Church. Rosa Parks. Martin Luther King Jr. and Montgomery Bus Boycott. Bloody Sunday. The Selma-to-Montgomery Voting Rights March. The balcony of the Lorraine Motel. Freedom Summer. And, of course, the Freedom Rides. We didn’t plan it this way, but David, Jennifer and I quickly realized that we were planning our trip the very year marking the 50th Anniversary of the original 1961 Freedom Rides. We also realized that we’d be on the road the same week in May as the original Rides. All sorts of commemorations were being planned for the days we’d be in Alabama. PBS was airing an original documentary about the Freedom Rides during the week of the trip and every day we awoke to newspaper articles discussing the significance of the Freedom Rides. As our bus rolled down the road it was like we were stepping back in time. Everywhere we went the atmosphere was thick with stories of heartache and heroism. As we walked the Edmund Pettis Bridge in Selma we were able to experience the courage of the Bloody Sunday marchers. Cresting the bridge you see below where the line of troopers, many on horseback and wearing gas masks, waited for the marchers. The courage of that march really can’t be communicated until you trace that journey with your own two feet as I had the summer before with my wife and two sons. Every day of the Freedom Ride was like that. You kept finding yourself on holy ground. And sometimes quite unexpectedly. We were pulling out of Memphis having just visited the Lorraine Motel where Martin Luther King Jr. was assassinated. Theron came to the front of the bus and asked if we might stop by the church were Dr. King preached his last sermon. When the bus pulled up to the church a security guard came alongside us. We explained who we were. Suddenly, the security guard turned into the best tour guide we had on the trip. He pulled out his keys, let us in and showed us around. And then the moment came when he let each of us go up and stand in the last pulpit of Dr. Martin Luther King Jr. This essay originally appeared in the Summer 2011 edition of ACU Today. The picture above, of MLK's final pulpit, the place he delivered the Mountaintop sermon, was taken by me during the ACU Freedom Ride. or website you can easily copy and paste the code from our site. share any future blog post you are trying to get more visibility to. That's an incredible story, Richard. Hopefully, some of those students will choose to "live" in the choices they make. Thank you.